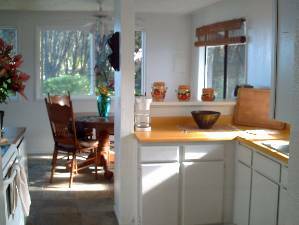 cottage can be rented together for larger groups. The internet access is through the telephone line. Kehena Beach – At this dramatic, clothing optional, black sand beach you won’t see any Japanese tour buses, but you may see explicit body parts. If you’re cool with that, then it’s worth the trip. It’s right off 137 just before the Kulani Honua Resort, you will see a small parking area on the ocean side of the road and a few cars. There is no sign marking the path down the bluff and no stairs, but it’s not a difficult walk down. Be aware the surf can be deceptively rough and waves crashing on the shore can be dangerous. Just be cautious and watch the other swimmers. Dolphins are frequently spotted playing in the beautiful blue water and the coconut palms and tropical setting is quite lovely. Recommended for the adventurous. Pualaa (also called Ahalanui) Warm Pools Beach Park – This county park is the best natural swimming spot in the area. This very large pool is situated right next to the ocean where the salt water gushes in at one end and the warm mineral waters at the other end. It’s a big warm pond on the ocean! The natural setting is gorgeous with coconut palms, picnic tables, showers and porta-toilets. Again this is on 137 and is well marked. This is a great spot for the whole family. Pohiki Surf Break – Considered by many to be the best surf spot in lower Puna! Not really any sandy beach but it’s an easy entry into the water and “Bowls” is an incredible tube ride. Just up from Pualaa Warm Pools Beach Park. Stay on red road (137) and you can’t miss it. There is also a boat launch and an amazing bay which has great waves too. Kapoho Tide Pools & Champagne Pond - Heading south on 137 leads past Kapoho-Kai Road. This road goes to one of the most unusual locations on the Big Island. Dozens and dozens of spring-fed, brackish pools and tide-pools, some volcanically heated, are strewn thoughout the area known as Kapoho Tidepools. Champagne Pond is located in the gated community of Kapoho Beach lots, but you can park and walk inside. You will find a calm, protected ocean inlet filled with crystal clear water. A scattering of fish and many sea turtles (I have seen 9 at one time) await. The ocean water is also geothermally heated (about 90 degrees on top) and changes with the tide. Volcano Area – Volcano National Park – This is a must and has something for everyone. The Thurston Lava Tube is a big cave created by the lava flow. The caldera and rim of the volcano is spectacular. Drive down chain of craters road to the end and hike to the lava flow. Be sure to take good walking shoes, water, and if you go at night a flashlight. Hilo Area - Richardson’s State Beach Park – A nicely protected black sand beach that’s good for swimming and snorkeling. Lovely setting with large trees, ponds, picnic tables and showers. Safe for children. 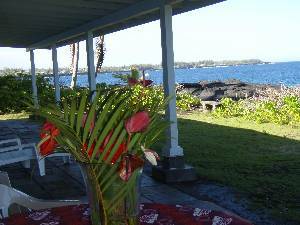 Located on the south end of Hilo Bay. Akaka Falls – A stunning botanical garden with one of the largest waterfalls on the island. Take a picnic and spend some time nature watching. About 15 minutes north of Hilo on the main highway. Hapuna Beach – voted the best white sand beach on the Big Island. Good swimming, boogie boarding, and body surfing, as well as snorkeling. Captain Cook’s Bay & Monument – in south Kona in Kealakakua is one of the most scenic bays you will ever see. A small black sand beach, but the water is like an aquarium with many varieties of tropical fish. Waipio Valley – on the Hamakua Coast this valley has a staggering look out that will make you a believer. This was the site of the last battle of King Kamahamaha’s unification of the island. Legend has it that sometimes the spirits of dead warriors appear on the valley wall. Horseback riding tours are available! Beautiful view of Kaloli Bay and Kaloli Point! Beautiful oceanfront living. The sunrise from the property is spectacular! Wow, thank you for a great house in an amazing location. the lava cliffs and breaking waves from the Pacific ocean. cannot lose with this place. Homeowner Response: You can't get much closer to the ocean and that is what we love about this home. 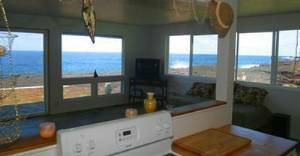 It is truly a Hawaiian Beach House and the location is superb for all the fun things to do and see in East Hawaii. Discounts for repeat guests, so please come back soon! being on the water was really terrific. I cannot tell you what a great stay we had. Everything about your house was more than we could ever expect. The view, the decor, the privacy, the comfort, just everything. We found the nicer and cleaner a place is you immediately treat it with more respect. That is a given in our family. For sure we would like to stay again in the future. Thank you so very much. Your respect for your guests show and it was greatly appreciated. The location and view couldn't be any more dramatic and wonderful! The first morning we were greeted by a pod of about 25 dolphins swimming together and breaching in a spectacular show. One week here just wasn't enough!! We rented the house and the cottage - which was also wonderfull! The breeze off of the ocean was refreshing and kept the house/s cool. We had everything that we needed at the house - and the owner couldn't have been more helpful! We did day trips to the Volcano night viewing - where the lava meets the sea, the tidepools, (where we swam with sea turtles) and Volcano National Park - don't miss the lava tube and if you are adventurous take a flashlight and go into the dark part of the tube!! The location was near enough to HIlo to get what we needed - about a 10 minute drive. THe farmer's market downtown is wonderful. If you love to cruise and always wanted a giant suite with a grand balcony to watch the sea - then you will have your dreams come true at Dolphin Bay House! The ocean is so near that you feel as if you are on a ship, and the roar of the waves crashing onto the rocks, will lull you to sleep!! This is definately a vacation home that we would love to return to again and again!! 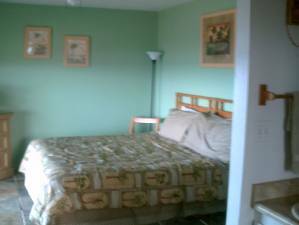 The furniture and beds are completely comfortable and there are ceiling fans in the rooms, for the rare moments when the breeze dies down. Our children ranged in ages from 15 - 7 and they all loved the home!! You have to know/watch your children here, though, as the cliff is right behind the house. We set boundaries of the yard and our children knew that they were not allowed on the lava rocks.If your children understand safety issues and follow the rules - they would be fine here. We felt perfectly safe sleeping with the windows open to allow for the breeze. The house is located in a lovely neighborhood - a great place for walking/jogging. This house is a slice of heaven - if you did nothing and went nowhere but just sat and listened to the waves and watched the ocean - you will never get a better view or a better value!! Mahalo, Pat and Andy, we dream of Dolphin Bay, still!! 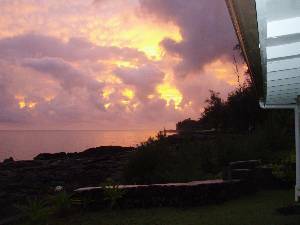 We absolutely enjoyed your Dolphin Bay home, the area is beautiful and the sound of the waves crashing on the lava rock was so relaxing. It was just what we needed. Property listing very accurate. Communication with owner excellent. Great location for day trips. Relaxing atmosphere with ocean waves lulling you to sleep. Highly recommended property!!!! The only word that comes to mind is WOW. We were so happy with our stay at the Dolphin House that we plan to stay there gain on our next trip to the Big Island. We felt right at home from the first minute. You can't beat the beautiful ocean view and listen to the crashing waves all day. What a way to go to sleep at night listening to the waves. What we liked the most of the location was that it was peaceful and calm....away from the huslte and bustle of "touristy" resorts. You have a piece of the ocean all to yourself. We highly recommend this to anyone who is wanting to spend some time on the Hilo/Puna side. Thanks again Pat and Andy! We had a WONDERFUL time! The house was everything we hoped - no surprises (which is nice, since we've had a few unpleasant surprises with lodging found on the internet). We actually had to close the door at night when the surf was too loud - Very Cool! Barbara was quite pleasant on the phone, checking with us before we left. The young lady living in the cottage was very sweet - we passed her driving out of the driveway on our way to an adventure, and introduced ourselves. I've already recommended your place to others who have seen our photos. Had a very short but very enjoyable stay. Highlight was definitely sitting on the deck chairs out on the lava flow, glass of wine, watching the turtles surf the waves.. with a very distant sighting of a last lonely whale at the end of the season. The house was comfortably furnished, had everything we needed, with great ocean views. 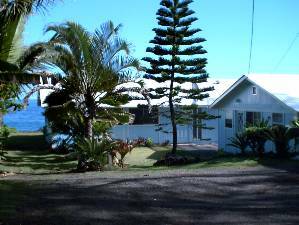 The house is in a secluded area, very peaceful, but with easy access back to Hilo and the volcano. Unfortunately the vog levels meant we didn't get to see the lava flow at night, but had a great day up at the volcano, would definitely recommend doing a Ranger Walk, very informative. Also, Pescatore Italian restaurant in Hilo, great food, kids menu available. I just returned yesterday from my wonderful trip to Hawaii. I have to say that the moment we walked through the door of the Dolphin Bay home I was filled with this feeling of awe. It is not often one gets to experience the ocean 24 hours a day. We saw whales, turtles, wonderful waves - wow. It was just what the doctor ordered. I am thanking the powers that sent my computer to your website. It was actually the first link that came up when I was looking for accommodation. Thank you for making your home available to people who don't often get to experience the grandeur of nature in such a spectacular place. The following week we stayed at Amy's beautiful condo and saw another perspective of the beautiful Island. It too was a marvelous experience. We hope to return to Hawaii again. Thank you for making this a positive experience, and I hope to return someday, and I will certainly recommend your home to others. 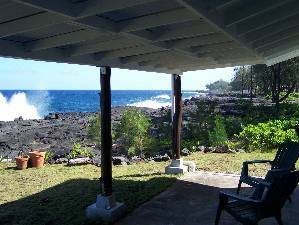 Property/Unit : 301938 - "Spectacular Oceanfront Dolphin Bay Home, Puna Coast"
Review Title : 98925 - "dolphin bay home is excellent"
"everything it was claimed to be. Wonderful place to stay would definetly stay there again. Beautiful mornings sunrise drinking coffee on the deck and beautiful sunsets. We saw sea turtles and dolphins. The sound of the waves breaking on the lava incredible Hated to go home. Treated very well by the owners. This place is a must stay again." Everything it was claimed to be. Wonderful place to stay would definetly stay there again. Beautiful mornings sunrise drinking coffee on the deck and beautiful sunsets. We saw sea turtles and dolphins. The sound of the waves breaking on the lava incredible Hated to go home. Treated very well by the owners. This place is a must stay again. We truly enjoyed our stay at your Dolphin Bay Home. It has such a marvelous view of the ocean. And all of the conveniences made us feel quite at home. On our last day there was high surf and we were just fascinated by how high the waves and splash came. There was also a good rainstorm while we were there. And that was quite a treat for us coming from the dry Bakersfield area. Thank you for the wonderful place to stay. It was our favorite stop on our trip and made our visit to the Big Island a memorable one. I just said good-bye to my Wisconsin cousins. We had a marvelous time. Your property is wonderful! We loved the "front lava cliff" and the outdoor table etc. I heard whales slapping the water in the night. Photographed incredible Sun rises, your pineapple plants, your sprouting coconut and baby tree, etc, etc. We LOVE geckos too!! The Volcano National Park, Hilo Parks, tide pools, Kona Coast, Rainbow Falls, Akaka Falls, South Point, Passion fruit smoothies, banana pancakes at KENS Pancake house, Boiling Pot , Tropical Gardens, etc. were wonderful experiences. Oh...my son & his cousin went scuba diving at night with the huge Manta Rays on the Kona Coast. WOW were they excited. My husband & son drove up to the top of Mona Kea to see the view & sunset the night before we left. I could go on & on!! I just remembered that I forgot to sign your guest book OOPS!! Please add this e-mail to the book! WE will definitely stay with you when we return! We loved this property! The ocean waves lulled up to sleep each evening and we awoke to a spectacular sunrise each morning. The place has a secluded, quiet feeling. I can't tell you how much we enjoyed your wonderful house...it was so hard to leave and explore the island...I have to say that where ever we looked we didn't find a house we would rather be at! I want to thank you for talking me into the house instead of the cottage...which was so cute too...but the house fitted our needs so well. I thought of that often during the week..it would have been torture to NOT be in the house..I would come back in a minute!!! And I will highly recommend it to everyone I know!! We loved our stay and the houses. Saw whales most days from the porch, Just a great time. Thanks again! Thank you for allowing us the use of your home. We had a wonderful time. I have never experienced a sensation like hearing and seeing the Ocean crash on the cliffs. I have pictures I will send to you and that we will share with friends who plan on visiting the Big Island. We had an amazing stay on the island. Thanks so much! The house is great! Take care. Happy New Year! sharing your lovely property with us! little pineapple that is growing in your front lawn. I had a great time. Maholo. I meet some wonderful people from New Mexico down the shore line on one of my morning strolls. The Big Island was a location we were looking at to buy a home on in the near future. So the trip was just perfect to explore. The volcano is a very long hike, we needed two attempts to reach the end of the of the rope (WOW!!). I thank you very much and will not hesitate to recommend you in the future. Yes, we had a wonderful time again, very relaxing. The house was great. We love the views. Judy will be inquiring about next year when we figure it out. . We’ll will be talking to you soon. What a spectacular setting! We had a wonderful time and spent hours watching the waves pounding the rocks. There was a true monsoon rain one day and two fairly dry days, each wonderful in its own way. My favorite memory: eating heavenly 4/$1 papayas while sitting on lava rock cliffs and being sprayed by the waves. By the way, we own vacation properties in the Borrego Springs and in Taos/Angel Fire, NM, in case you have a hankering for the desert. Mahalo. We had a wonderful time. 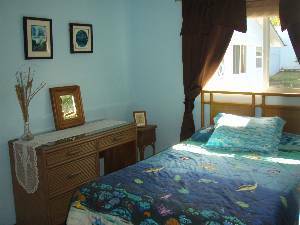 Above rate is for the Dolphin Bay House double occupancy, $15/night each additional guest, max. 6 guests. Add 13.42% HI state tax, $90-110 cleaning fee & refundable $300 security deposit. Deposit: 50% of total due at time of reservation, balance due 4 weeks prior to travel. Cancellations and Refunds: Deposits are refundable up to 45 days prior to scheduled arrival minus a $50.00 bookkeeping fee. After that, deposits are refundable only if we can re-book the time that you had reserved (minus a $50.00 bookkeeping fee). Other Fees: Refundable $300.00 security deposit.